At his English manor house, Joseph Temple is getting a shave from his ill-treated servant Bartu, who is a believer in voodoo. Responding to a threat of a beating at the hands of his master for not responding to a question, Bartu, razor at Temple's neck as he begins the shave, strongly suggests that he not even think of beating him. Later, Temple discusses with his daughter, Ann, the guest list for a party to be held that weekend, which includes Charlie Chan, along with his son, Barry, who helped him in the past in Honolulu, and Michael Ross, a geologist who had recently discovered uranium in Honduras, and Temple's nephew, Harold Carr, who had accompanied Ross on his expedition. Ann is incensed that Michael Ross, her possible future husband, was not invited. Temple insists that Ross is a fortune hunter and that Ann will be left off of his will should she ever marry him. Ann states that Michael will be attending the dinner party at her invitation. At the party, Temple informs Harold that he will buy Payne's half of the uranium discovery and turn it over to his nephew, holding the other half himself. As Bartu serves the guests, a visibly stunned Harold Carr notes a snake tattoo on his hand. 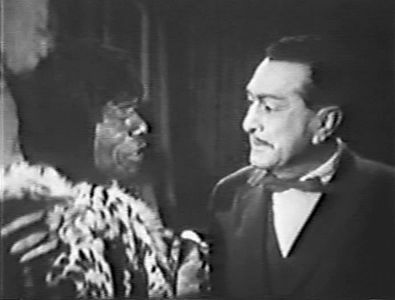 Harold warns Temple that the tattoo signifies Bartu's having been initiated in the most secret rites of voodoo and that he should treat his servant better so as not to place himself in danger. Later, Ann and Michael announce their intention to be married. An angry Temple informs the couple that he will meet with his lawyer in the morning to remove Ann from his will. Early the next morning, Barry tells his father of a terrible argument he heard between Temple and Michael Ross late the previous night. Suddenly, a woman's scream is heard. Finding Ann with the body of her father, Chan informs her that he was murdered and the police are called. Later, the police inspector informs Chan that Temple died of a fractured skull and that it was certainly Bartu, who has now disappeared, who killed Mr. Temple due to his ill treatment. Soon Bartu is found on the manor grounds, admitting that it was indeed he who killed his master. However, a skeptical Chan shows a voodoo death fetish doll that he had found in Bartu's room with a nail piercing its heart. He realizes that Bartu thought he killed Temple through his magic. Bartu had found his master dead that morning and fled, thinking he would be punished for his "crime." Barry then recounts the late night argument that he had heard between Temple and Ross and the fact that Temple had planned to cut Ann from his will the next day. Questioned by the inspector, Ross admits to his heated differences with Temple, but he insists that he did not kill him. The younger Chan notes to his father and the Inspector that when he came to his room, Temple was in the process of reading a cablegram which he placed in his desk. Quickly checking the desk, Chan finds the document and the Inspector asks Barry to fetch Payne for questioning. After Payne is questioned, Chan, not convinced of his connection to the murder, suggests that Harold should be questioned. When interviewed, he states that Temple may have mentioned the cablegram to Payne on the night of the murder as his uncle had asked him to have Payne speak with him. "Ross, Payne, Carr – which is it?" asks the Inspector after the interview. Barry then notes that no one has questioned Ann who had much to lose if she were removed from her father"s will. Ann leaves no doubt of her dislike for her deceased father, but just as emphatically states that she would never have killed him due to the possible loss of her inheritance as money has never brought her happiness. She leaves the interview in anger when the Inspector suggests she may have been concerned that Payne may have left her if she were no longer wealthy. Chan then suggests that all suspects be gathered together in Temple’s bedroom at midnight. At midnight, Chan tells the assembled suspects that he plans to use Bartu’s voodoo to reveal the identity of the killer. Payne protests, fearful of the possible dark forces involved. Chan then turns out the lights and a mysterious drumbeat begins which has an unsettling effect on all in the room. Bartu suddenly joins the gathering, stating the power of his voodoo. Holding a live snake, he begins his voodoo rite, stating that the guilty party will be subject to a supernatural death. Suddenly, as Bartu approaches him, a terrified Harold Carr jumps from his seat and admits his guilt. Chan states that Harold had made a false claim of having discovered a rich uranium deposit in Honduras, hoping that his wealthy uncle would offer him money for the claim. When the cablegram arrived, Harold knew that this would spoil his plans, so he killed Temple before he could back out of his deal made earlier that night. Chan notes how Harold had tried to frame Payne by leaving the cablegram in Temple's room. Chan thanks Bartu for his help, giving him the voodoo drumbeat record he found at a local museum. Joseph Temple (to Ann Temple): "…that Chinese detective, Charlie Chan, who did me a service in Honolulu." Joseph Temple: "Mr. Chan did brilliant work for me in Honolulu; a masterpiece of deduction." A cup of good tea on arising is almost preferable to handful of emeralds. More certain than the rising of the sun, the blooming of a flower, and the branching of a tree is the fact that my Number One Son will have a theory. Ancient saying: "Never bet on unsure thing." A loyal friend is like rare white jade from ancient Hansu period – both are beyond price. The best evidence sometimes comes from the mouth of the criminal himself – or herself.